IDC market research has shown that 72% of corporations have experienced intrusion from hackers. Firewalls alone are definitely insufficient against these malicious activities. These activities often relate to content tampering and web defacement, and thus cause loss of services, loss of customer confidence, and even financial liability for government and corporations. Content security is a serious issue today. eB-Patrol is a real-time content monitoring, recovery and security tracing system. eB-Patrol not only detects any unauthorized alternations against the monitored files, but can also instantly recover the original content, direct the alert to the proper person, respond with user-specified executables, look up the source of suspected IP and gather the related security events on the monitored machine for investigation. With 24x7 detection at file levels, directory levels and system process, eB-Patrol safeguards your system from both external and internal threats. eB-Patrol protects essential files such as web pages, executables, scripts, applets, etc. eB-Patrol complements firewall and intrusion detection systems to complete the corporate security strategy of prevention, detection, and response. human errors (e.g. accidental alternations to critical files). With 24x7 monitoring, eB-Patrol proactively protects the content against continuous security threats. 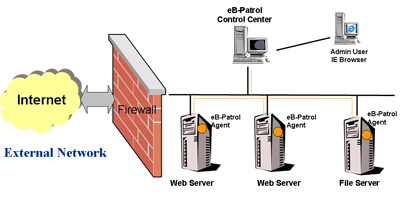 eB-Patrol complements with the deficiency of existing firewall and intrusion detection systems to effectively guard against invasions. Provide smart update function to allow authorized users to update the content without suspension of monitoring. Ensures the content under unceasing protection. Administrator can use IE browser to implement monitoring and management at anytime and anywhere. Task group management function allows administrator to control dispersed files effectively and systematically. Flexible and secure access enhances user convenience. Quarantine the tampered files and preserve the related information (altered files and security log) for future investigation. Operation system︰ Windows Server 2012, 2008, 2003, 2000, XP. Disk space︰ 60 MB for storage space for content backup and log files. Disk space︰ 200 MB for storage space for content backup and log files.